I like the idea of `soukou no tsuma' (a wife who has gone through hardships of poverty with her husband from the beginning of their marriage). But I didn't have the fortune of becoming a `soukou no tsuma' with the total of only 10 [she lived with Shunryu for almost 10 years but they were married twelve.] years of marriage with two husbands, and I feel sorry for my daughter who hadn't known her father. However, I'm extremely happy and most grateful for having been able to have feelings as a mother. Looking back upon the past 77 years of my life, I feel so keenly how the fact that I have a daughter who lives in Japan has been enriching my life. I got married to my first husband on November 3, Showa 11, and got pregnant about 2 months later. My daughter was born in October the next year. I married to an aviation soldier of the navy without a faintest idea of the war breaking out so soon. The China Incident took place on July 13 the next year and he had to leave for the battlefield. First, we were living in the navy residence by the air base of the navy in Yokosuka, and then moved to Tateyama as he was transferred there. We had hardly unpacked our belongings at our new home in Tateyama when we heard he was to be transferred again to Kisarazu. In retrospect, there was a growing movement towards the war then, but I heard nothing from my husband about it. Half a year after we had moved to Kisarazu, we had his mother come to live with us. We found a house to live at in Kisarazu, but my husband left for the battlefield after spending just one night there. I was pregnant and my stomach had grown quite big by then. I went to the beach near the air base in Kisarazu to see him off. I carried a flagpole, which was over two meters long, on my shoulder to the beach. It was a hot day. I wrote huge letters that said "Matsuno ganbare! (Good luck, Matsuno! / Do your best, Matsuno!)" on the sands. The time until I had my daughter the next October was the most trying time for me. I often heard passing children singing a war song, which made me anxious that I might receive a telegram (to inform me of his death) before our child was born. Some families of his fellow soldiers had been receiving such a telegram. I measured the size of my stomach every now and then and wrote it in my letters to my husband as I had no other way to let him know about our child's growth. I didn't know his whereabouts then, but I heard later on that he was stationed in Saishuu-tou (the Japanese name for the Korean island that is the closest to Kyushu - Cheju in Korean), from which he flew to attack Nanking in China, and, after that, he was stationed in Nanking to attack the mountainous interior of China. In April the next year, my mother-in-law suggested I should go home for my mother's anniversary service so that my relatives there could see my daughter for the first time. Just then my sister and her husband were coming to Tokyo to attend a wedding as the `nakoudo' (go-betweens) so I could join them in Tokyo and go to Shizuoka with them. (Kisarazu is close to Tokyo.) My mother-in-law said that I had been going through such a hardship that I deserved a rest with my family who would look after my baby daughter and that I would enjoy the cherry blossoms there. However, on April 29th, I received a notice of my husband's death. I was in Shizuoka then. That day I was visiting, with my daughter, a cooking teacher of the girls' high school I had gone to and we watched the midday news on TV which reported on two Japanese warplanes that hadn't returned from the raid mission in large formation to the interior of China. I said to the teacher that one of them might well be my husband's, and she said "How worrying it is." It was that evening when I received a telegraph from my mother-in-law in Kisarazu on my arrival at my family home. Before that, --- it was March 3rd that year ---, a package from the air base in Oomura, Nagasaki, had arrived at our home in Kisarazu. It was from my husband. I told my mother-in-law "He seems to have come back to Japan." We also got a telegraph from him which said "Congratulations on your first Doll's Festival, Harumi." In the package, there were a music box, a Kewpie doll and two or three other celluloid toys. We placed the telegraph and the toys on the tier stand for `hina' dolls at our home and kept them there throughout the Hina Doll's Festival season. He had been in Oomura for a week, but he left for Nanking again to bring back a plane. He asked for permission to make a call to his family before he left Oomura, but it was not granted. So, he asked if he could have his wife and daughter visit him in Oomura for however short a while it might be, but that request, too, was turned down, as he was to leave very shortly. He left without seeing his daughter even once. He said in his letter that most of those who had gone to Nanking with him went back to Japan in April, but he had to stay there for there was not enough reconnaissance and he was needed there although he wished he had been able to come home and hold his daughter. In every letter I wrote to him, I said "Please remember people in China are no different from me. They are families waiting for the safe return of their husbands, fathers, brothers and sons who have gone to war. So, please don't drop bombs on towns. Please try to drop them on places like rice fields only to startle raccoon dogs (tanushi)." When I talked about that at my husband's 50th anniversary which was held three years ago, my relatives were so surprised that I had really written such a thing at that militaristic time. But I really did! I saw the musical "Li Koran" recently and felt overwhelmed by the cruelties the Japanese army did to Chinese people. My mother passed away, when I was little. So, perhaps, I grew up with hunger for motherly affection. Because of this, I tried to do everything on my own. As my elder sister had already got married and was living away from us, the wife of my elder brother was the only one who could look after me. I had to take care of my own needs such as clothing. I was stiff-necked and proud of my smartness. I disliked that personality of mine. I always longed to have a warmer personality. Wanting to cultivate my mind, I started to go to church, although my family scolded me for doing so. As I went to a Catholic kindergarten, I was familiar with Christian practices such as prayer and with stories from the Bible. I went to that kindergarten because it was quite close to my home. It was after I finished a high school that I started to go to church. My family scolded me since they thought my involvement with the church would put off my chance of marriage. Behind our house was a mansion where a young minister fresh from Aoyama Gakuin Daigaku (a Christian university in Tokyo) and his wife lived. I went there every day and I was a favorite with them who had no children then. I liked that mansion more than my own home where I felt lonely. I helped them with the Sunday school. I was baptized on one of those days. How do you see your life in the States? I have been living in a special environment, that is at Sokoji for eight years and at Zen Center for 22 years. I'm thankful for my having enjoyed the conditions which are not found outside a temple like this. Everyone here, not to mention Baker roshi, has been very kind to me. 22 years have passed by while I was teaching something of tea ceremony here. My Japanese friends tell me I have been living in an unusual place and the American society is nothing like what I think it is. I don't know much about the outside world, but I'm very happy and grateful to have been living here. People of Zen Center come running to me whenever something comes up. My tea students have endured pain of sitting with legs folded well (seiza). They must have more severe pain than Japanese do from sitting that way. They try hard. But I often had to slap a student on the hand as he was a little too old to remember new things, and kept forgetting manners I had taught him before. He would say "I don't know." I told him "I have taught you this a million times. Please don't say `I don't know.' but say `I'm sorry. I forgot,' would you" We have experienced this kind of discrepancy in attitude and expression. If a Japanese person spills tea, he or she apologizes hastily. But, American students of mine say neither "Thank you." nor "I'm sorry." when he or she spills tea and I clean up for them simply because they don't think it's their fault but it was just an accident. I was often surprised by such difference in mentality. But I do understand they are good by nature. They would look blank quite innocently, wondering why they were told to say "I'm sorry." The biggest thing that made my teaching them tea difficult was that they have not learned the distinction between right and left. The sense of right and left is the basis of tea ceremony. Those students without clear sense of distinction between right and left --- perhaps due to the American education --- must have had a lot of difficulty studying tea ceremony. But they tried to do faithfully what I taught them to do. They were sincere and docile. Although I didn't have adequate utensils nor proper knowledge about the manners of tea ceremony myself and taught in a room like this [the tatami room outside her kitchen - it's big and nice - just not a tea room - another room], I had fortunately studied Zen so that I tried to have them understand the spirit of tea ceremony as well as possible. I might have been trying to teach them by the means of words more than by the demonstration of manners. I taught them like this. In a small space of a tea room, there are a host and guests, and harmony is created. The host cares about the guests and the guests care about the host. The host tries to make good tea not for himself or herself but for the guests, and the guests wishing warmly that the host will make good tea without any blunders watch the host making tea. Such goodwill towards each other creates the harmonious scene. That's the spirit of tea ceremony. Although individualism and noninterference with other people's business are characteristic of Americans, I wished my American students would take in that spirit as much as they could if they wanted to learn Japanese culture at all. Just two days ago, I gave my last tea ceremony here, that was also the anniversary service of the death of the tea master Rikyu. There I made a sort of admonitory speech about how they should be mentally prepared for studying tea under a new teacher and with what intentions I had been teaching tea to them. Since my students were also students of Zen, I think they understood what I tried to transmit to them, more than other Americans who had never studied Zen would have. They often told me that they were happy to have a tea teacher who had studied Zen. I think it's quite strange that there are very few tea teachers who study Zen though tea ceremony originated from Zen. And I, a Christian, have been teaching tea. Tea is same as Zen. I don't know difficult words of sutras, but Dogen taught Zen is in how we go about everyday activities such as talking, eating, going to the bathroom, and using water to wash our faces. Tea is also like that. If you wish well and feel kindly toward the other party in the same way as at a tea ceremony, whenever and wherever you meet someone, then you have attained the tea mind. Please tell me about your haiku. It was in Tassajara that I asked Hojo (Suzuki-roshi) how he thought if I started haiku composition and he said it was a good idea and I should do it by all means. It was around 1970, I think. So, I started haiku just before he died. Although he was sick in bed, he kept saying composing haiku was a good thing to do, except when he was too sick to talk. It was also he who made me start tea. He bought me a book on tea ceremony out of some impulse one day and that's how I took up tea. I'm grateful for him to have left me with these two things, tea and haiku. Without them, I wouldn't have been able to make myself useful here and wouldn't have lived so happily under the care of Zen Center for 20 years. The best thing about haiku composition is that it makes you see things with care and appreciate the preciousness and the beauty of nature. It was after I started composing haiku that I have become to feel heartily that human beings are sustained well by nature, which makes me grateful for the sun, water, air and so on. To compose haiku, you also need to see things honestly and express your perception honestly. Just like Zen which says knowing yourself deeply is knowing the Way, haiku makes you face your own dirtiness and then clean it up. In Japan, haiku-composers usually belong to one or more haiku associations led by haiku teachers. But that's not possible in the States, so I compose haiku on my own and only go to the meeting of the group of haiku composers around this area once in two years. It's nice to go to such a meeting as I can learn different characteristics of other people's haiku. It helps to improve your skill of haiku-making and deepen your haiku mind if you regularly contribute your haiku to a haiku magazine to have your haiku evaluated. But, at this old age, I don't have such ambitions. I only make haiku in the way I do. In order to score high in a haiku magazine contest, you need to make the kind of haiku that suits the taste of the president of the magazine who has his or her own style of haiku-making. But, being as old as I am now, I don't care if my haiku is selected or not for magazine contests. I can go on quite happily making haiku with my style. I must be a backward student from the viewpoint of haiku magazines. I have won the first prize several times in the haiku magazine issued by Eiheiji, maybe because it's a magazine to which a lot of haiku with Buddhist connotations are contributed. But my haiku are hardly selected by the magazines of the associations I belong to, and I don't get good marks in the haiku group of this region. But such a thing doesn't bother me at all as I'm over 70 now. What do you think Suzuki roshi had in mind when he said he wanted you to stay here after he died? When he was dying, he first told me to go back to Japan. I think he wanted to do `saitokudo'[ him do it or her do it], that is to keep his wife away in order to spend his remaining time for his students alone although he didn't actually say so as he had become too weak to talk much then. I told him "I would comply with your wish, if you were getting well. But I couldn't possibly leave you like this. Who would cook okayu (Japanese rice gruel) and other Japanese foods for you" I wrote to Hoitsu for advice. He wrote a letter to each of Hojo and me, and the letter for me said "I do understand Shisho("master" meaning Suzuki roshi)'s feelings. But I'd like you to stay with him at any cost, or someone from our family like my elder sister would have to go to take care of him. I can imagine how hard it must be for you, but please stay and look after him." It seems Hoitsu's letter to Hojo persuaded him to give up his wish for `saitokudo'. I asked Hojo what I should do after he died. He said "Stay here and help people of Zen Center." I asked him "How could I help them I don't even speak English." Then he said "You can do it since you are honest and impartial." I just thought "Hum..." then. However, nowadays, after 20 years, I realize more and more how fortunate I had been as a wife to have been trusted that much by her husband. How do you see Zen Center of today and Zen in the States? I don't think about such matters at all. I have been only teaching tea here and such matters don't interest me much. I have no opinions. I still feel the same way towards Zen Center although the number of people here has grown quite a bit and I think to myself "Oh, I don't know the names of most of people here now." But, I think everyone here, whether I know their names or not, is my friend, so I put my hand on the shoulder of anyone new and ask him or her where they are from. He may say "I'm from Iran." and I'll say "From Iran! Well, well!" I talk with people on the rooftop just like that. Though I tell them not to tell me their names as I can't remember them, I try to speak to them as much as I can. I only wish Tenshin-san, Mel-san and Baker-san to do well as they are Hojo's disciples. I have no particular wish for how Zen Center should be in future, though. Hojo always said "I won't interfere with Zen Center at all once I have handed over Zen Center to Baker. It is entirely up to him whether it will be ruined or come to an end or not." I like that attitude of his, so I, too, have nothing to say about Zen Center now. Tenshin-san once said something like "I feel easy as I heard Suzuki roshi had said he wouldn't mind if Zen Center would come to an end." I told him "Please don't always think like that so imprudently." Hojo gave Zen Center into the hands of another person, trusting him to do his best. So whatever way the successor might do, Hojo wouldn't say a word about it though he would give advice if he was asked to, of course. I do notice how the kinds of person who come here have changed since Baker-san became the abbot. The change of times may be one of the factors. The types of residents in this area have changed. There are a lot more Asian people living around here. I feel as if I were in a different temple when I see people who come here on Saturdays and Sundays. They are so different from those in Baker's time. I don't know if it's because the abbot has changed or because times have changed. But I think it's good, anyway. They come here to seek the way. Right now I'm having my students choose their new tea teachers. I'm doing the paperwork for that. I'd like to finish my responsibility as well as possible so that it could be taken over smoothly. There are quite a few students who are opting to quit tea lessons altogether. I said "quite a few" but then I have only a few students. I don't know yet what I'm going to do and what my life is going to be like after I retire next month (April). I'm teaching tea until the end of this month. A fiscal year for tea ends in March and a new one starts in April. I will retire from the board at the end of this month as well. I will remain as a Doumon member of Omotesenke school, but I will withdraw from the `shachuu' (the tea ceremony clique). For 77 [ she was born in about 1914 so this interview was in 91 (confirmed)- what's her birthday and year for sure] years I have managed to live without having to ask my daughter even for a penny as my pocket money. I'm really content with this fact. I have nothing to look back on with regret if I'm to die tonight. Tenshin-san kindly said to me that my presence will benefit both the Center and people here so they would like me to stay here. I replied to him "Thank you very much. I have fully understood the kind intention of the Center. The remaining thing for me to consider then is my personal life like my health. I will make up my mind after thinking about these matters." Ten to one I will go back to Japan, considering my health conditions and all that. If I go back to Japan [she returned in October of 93], I will live with my daughter's family. I have one granddaughter, who is married with two children, and one grandson. My granddaughter's family lives near my daughter's house, so my great-grandchildren often come to my daughter's house, I hear. My daughter has come to visit Zen Center twice. Hojo had treated her with much affection since she had been a child, and she has a great respect for him. There is a Buddhist altar for Hojo in my room at my daughter's house and another altar for Matsuno family in the room of my daughter and her husband upstairs. When I stay at her place, I offer a cup of tea to both altars in the morning. Harumi, my daughter, respects Hojo and sees him as her father for she grow up without knowing her real father, so she keeps alters for both fathers of hers. Her husband has married into Matsuno family since Harumi needed to be the heiress of Matsuno family, being the only child of my first husband who was the eldest son of the family. Although Harumi's husband is the eldest son himself, he has married into Harumi's family because they are second cousins. Every time I went to visit Shizuoka regiment during the war, I transfixed a doll of Roosevelt (with a bamboo spear), saying "Kichiku bei-ei! (Americans and British are devils!)" I had the impudence [nerve] to come to the country of people I used to call such. At first I felt very strange to be in this country. We said we would all be shot by American soldiers with machine guns when Japan had surrendered. As there was a firing of a gun to Shimizu port, we feared that American troops would disembark at Japan. I said we didn't have to be afraid because we'd be made to stand in a line and then be shot to death all together by American soldiers. So, it felt somehow strange to live in this country when I first came here though it doesn't seem strange at all now. The other day Mr. Yoshimi Ishikawa, a Japanese journalist who is traveling around the States to lead what's called "Ten Dollar Movement" ("Ten Yen Movement" in Japan) visited me. He said Japanese are the people who are not able to express their opinions. However much, 9 billion dollars, Japan may raise capital for hotels, banks and so on in this country to help it financially, Americans dislike Japanese and don't feel friendly towards us at all. Having spent his youthful years in this country, he is trying to find the solution for this problem. The most basic motivation for this movement he is leading is that he feels it absolutely necessary for the Japanese to break off their insularity and come out to the international scene on a equal footing with other countries. This movement is to write your own opinion on a ten-dollar bill you donate. He says Japanese can't do that in public. I donated ten yen[ 1,000 = $10] and wrote down my opinion. All the donated money is to be used for the States. It's not just money, but opinions are attached to it. That is important as Mr. Ishikawa said. There is not a president nor a secretary for the movement. Everyone is just a member like everyone else. There is a bank account into which donations are paid. That's all. The opinion I wrote was that I wish a sort of museum to remember the atom-bombings on Hiroshima and Nagasaki will be built in the States. I think "No more Hiroshima" should be said by the Americans and Pearl Harbor should be thought about by the Japanese. The present situation, however, is the opposite. The opinion which was written by the largest number of donators will be published on the 50th anniversary of the Japanese' attack on Pearl Harbor this year [so it is 1991]. Japanese business men can't write their opinions for such a purpose. I think that kind of thing is one of the reasons that Americans say they can't understand Japanese. I often tell my students "I'm very like you as I can express my own opinions like you do. That's why I have been able to live here with people like hippie-san for 30 years. If I were a normal Japanese who thinks modest taciturnity is a virtue, I wouldn't have been able to live here for so long since stress would have mounted up within me. 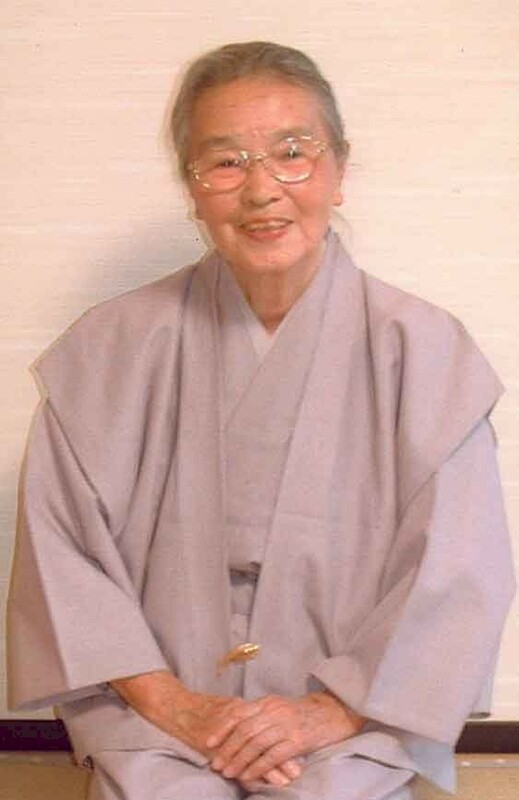 I have been able to express my opinions, also because I have learned the Buddha's way from Hojo." My personality has been becoming to be one I quite like though I used to hate myself. Now I can say "I like `Suzuki Mitsu san'." I used to loathe my personality so much that I even contemplated suicide. I couldn't stand my tendency to hurt feelings of others. I thought a person like me was not worth living and should die as soon as possible. I thought like that in my adolescent days. Now I wish to have one pill --- a pill to terminate my life. I have reached this stage at last. While I have the fortune of enjoying health good enough to take care of myself, I'd like to be gone with gratitude. I'd like to be gone without putting anyone to trouble. Tenshin-san said to me "But, please don't try to put an end to your own life." I have trouble for that very reason, that is I couldn't do it by myself. I hope doctors, priests and lawyers will decide on it as quickly as possible or people like me will be in trouble. I'd like to put an end to my life, saying "I've lived my life in a magnificent way to my satisfaction, so I'd like to go now." It is the task for doctors, religious leaders and lawmakers to think the way to allow people like me to make an end of their own lives of their own free will without getting others into trouble by doing so. That's my opinion. Younger people who want to live on may think such an idea is unimaginable, but I came to reach this state of mind one or two years ago. I always say to my daughter on the phone that I'll be only too happy if I don't wake up tomorrow morning. I tell her and her family to say "Banzai, Mother!" if I end here. They don't have to come to see me at my deathbed. I've said what I've wanted to say and I've written what I've wanted to write. My daughter says that very few daughters receive so many letters from their mothers like she does so we must have kept in more constant touch with each other than most of mothers and daughters living in Japan although we have been living in different countries for the last 30 years. She also says she will be able to feel close to me even after I die as she can read hundreds of letters from me she has kept. Since she has studied Zen as well, she understands my views and feelings quite well.